Klitschko, food for the lion? The young lion of London is being force-fed in order to enter the arena as a devouring monster. The old Ukrainian underdog is learning new tricks in the hope that even a giant can discover an incredible lightness of being. So into what will the graceful arch of Wembley Stadium be transformed next Saturday night? Neither of these combatants for the heavyweight championship of the world could have applied greater diligence to their rigours of preparation. 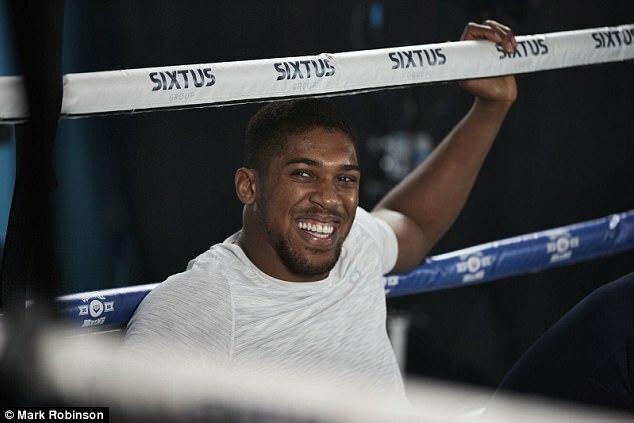 Anthony Joshua has delved into every known aspect of sports medical science. He has sat in ice chambers, breathed through oxygen masks, worn body monitors and responded to their readings. All that so as to minimise rest and recovery time before ensuing sessions of perspiration and punishment. In the hardest game they talk of the need to live the life. 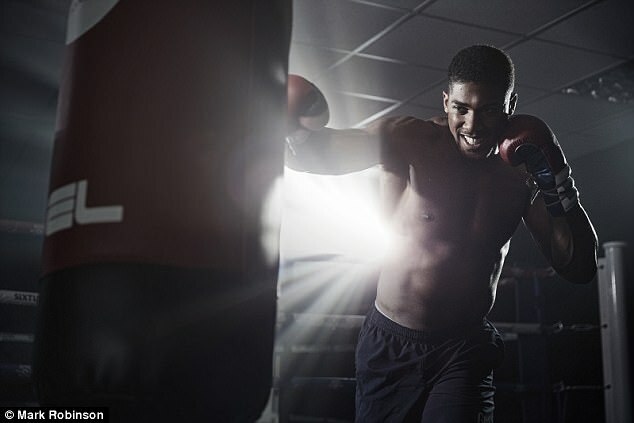 Joshua has submitted to that mantra wholesale, much of the time in almost monastic retreat at a sports institute in Sheffield, where his trainer Rob McCracken also coaches the UK’s next generation of Olympic boxers. All that in addition to the physical routines of an intense training camp. Then there is the diet. 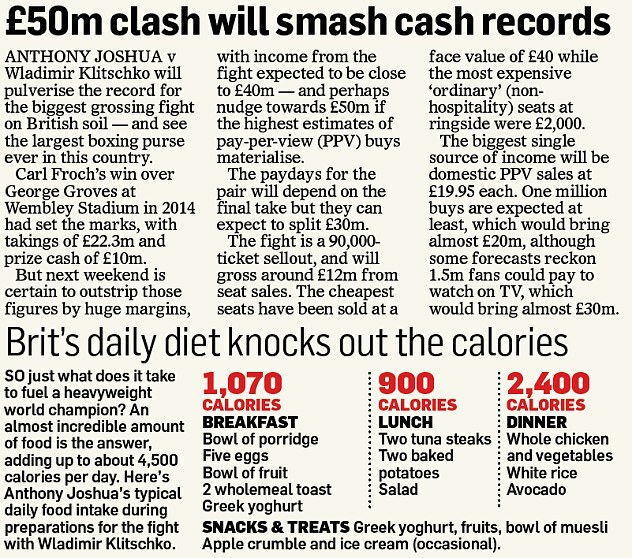 Joshua’s nutritionist supplies him with a menu which, although comprised of health foods, enables him to ship double the recommended intake of 2,500 calories a day. In addition, he ingests supplements, seemingly by the bucket-load, to build muscle and develop yet more of the punching power which has stopped all his professional opponents to date. Indeed Wladimir Klitschko might have felt a little uneasy watching Joshua go about his business last week. There was a jab here, a joke there, not to mention a few reminders that he finds something deeply amusing about the size of Tyson Fury’s backside. To all intents and purposes, Joshua appears no different in his state of relaxation than he has ahead of any of his other 18 fights. But it is one thing to perform among his entourage at the end of a 10-week media blackout in Sheffield. The question is whether he will feel overawed when he walks to the ring next Saturday, in front of the biggest fight crowd this country has seen since Len Harvey faced Jock McAvoy at London’s White City in 1939. 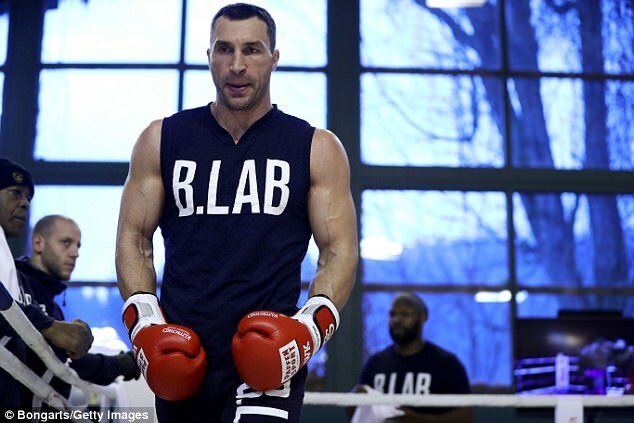 That much is currently unknown and it is one of the areas in this fight where Klitschko would logically seem to have the edge, given he ruled his sport for a decade and has experienced the lot. 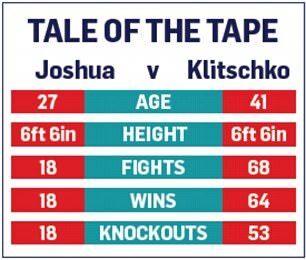 For Joshua, so much is still new and that, evidently, is what Klitschko has been playing on in the build-up to this great clash of eras. 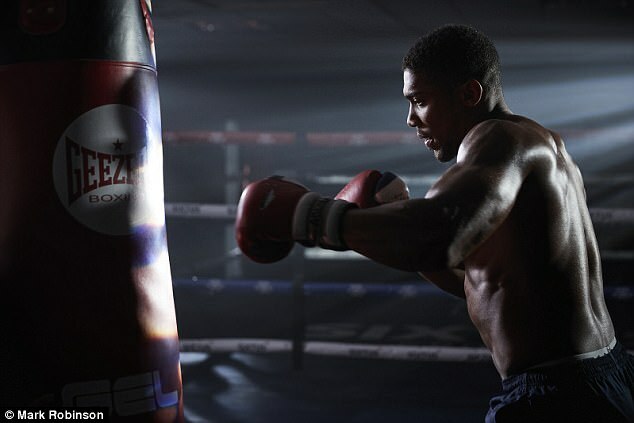 His latest efforts to unsettle Joshua are revolving around the subject of pressure. Namely, the 41-year-old is playing the role of the old champion with nothing to prove and questions if Joshua, the IBF world champion, can cope with the burden of being the great, unbeaten hope of the heavyweight division in front of a 90,000 crowd. Distinctly mild by pay-per-view hype standards but the point is relevant because Joshua is still unproven among the sport’s elite, despite holding a world title and there is no doubt this fight and its environment are wildly different to anything the 27-year-old has faced before. If he is vulnerable to pressure, this fight against a living legend, far more so than the 2012 Olympic final, will prove it. Klitschko said: ‘All the pressure is on the other side and not on me. I don’t need to defend my titles, I don’t need to worry about a first loss. He needs to knock me out as he promised. ‘He wants to become a billionaire. He needs to show what he is capable of doing and I think that combination is a tremendous pressure, an unbelievable pressure. ‘He is in a position where he basically needs to show to the world what kind of guy he is. I’m considered to be food for the lions — so he needs to eat that food or break his teeth. Neatly put. 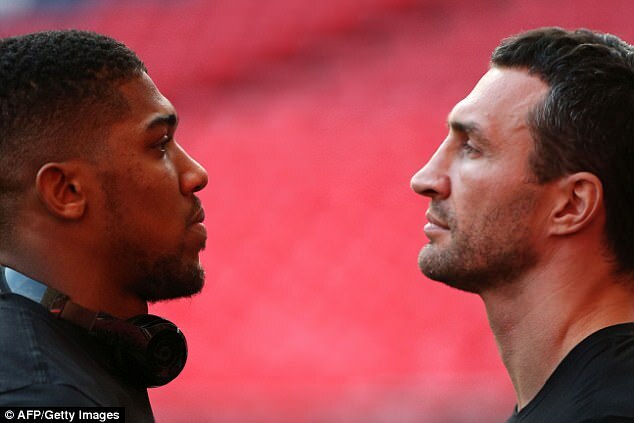 But Klitschko’s experience will only count for so much against blunt force if Joshua succeeds in handling the occasion. 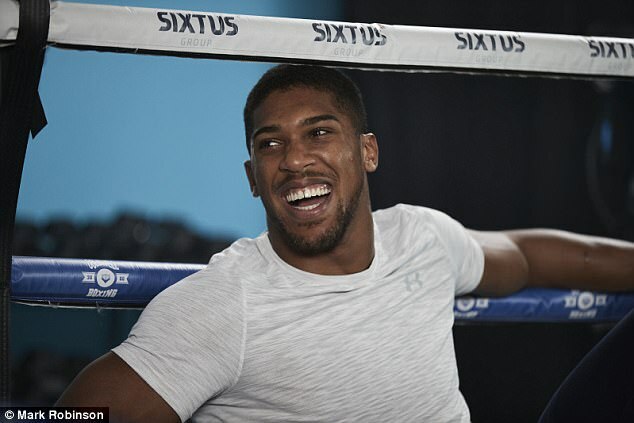 Nothing and no one has troubled him so far, barring one punch from Dillian Whyte in the second round of a grudge match in 2015 that soon ended in Joshua’s favour. But if there are any inconvenient truths hidden by his hype, there is a better than fair chance they will be exposed by a Ukrainian who, in the estimation of many, would probably rank in the top 10 in the history of the heavyweight division. At the very least, they would have been exposed by the Klitschko of old, rather than the one who was humiliated by Fury on his last outing 15 months ago. He was gun shy that night, timid with his punches and sluggish in his movement. It may have been a blip or it may have been a sign that his time as an elite entity is up, so a compelling part of this narrative is over what he has to prove. 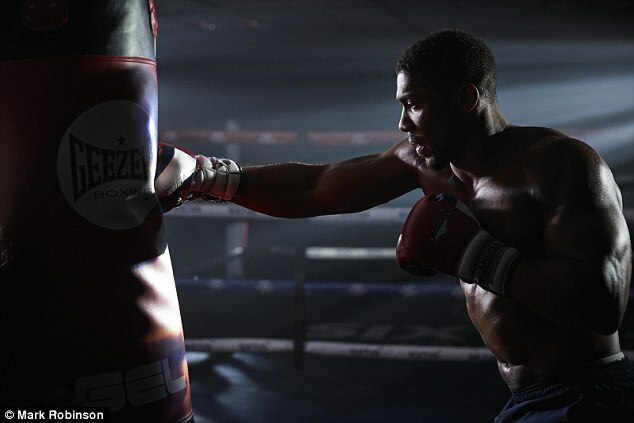 Joshua has been drilled by his coach Rob McCracken to believe he is facing the best version and said: ‘It’s interesting. Everyone says he’s old and so on and so forth and I say, ‘Yes, I agree, he is’. But then I think he has to have something mentally that makes him feel he can still compete, so he must be in a good place mentally. Certainly, the promise of a £10million cheque — both men are earning the same — has not forced Klitschko’s hand as he can afford to turn down that kind of money. 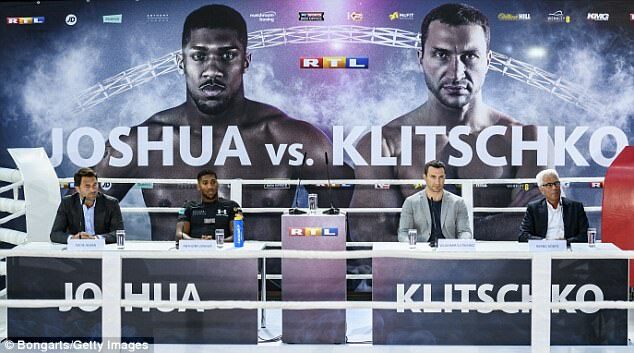 Redemption and legacy are the aims and it is interesting that Joshua admitted he sees himself fighting at Klitschko’s age. First he must live up to his billing as favourite and overcome his biggest challenge. 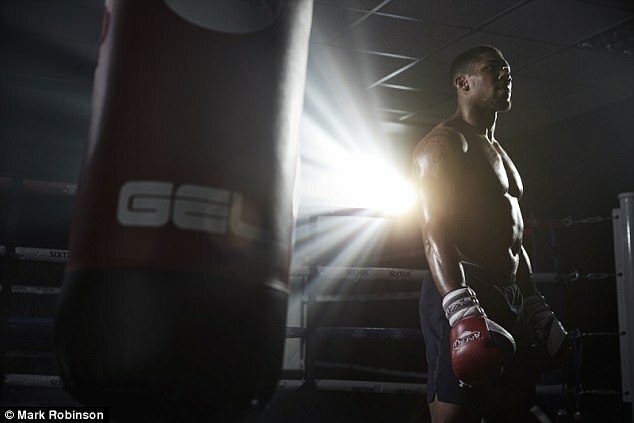 Anthony Joshua talks emotionally about how boxing saved him from a life of crime in a behind-the-scenes documentary to be aired this week. Joshua had to wear an electronic tag on his ankle when he was released. In 2011 Joshua was stopped for speeding and found in possession of enough cannabis that he was charged with intent to supply. He pleaded guilty, was given a 12-month community order and turned his life around. In an emotional scene in the documentary, Joshua is filmed giving Sean Murphy, his former trainer at the Finchley boxing gym, a BMW sports car, saying he feels obliged to help those who helped him.